Well the trailer is packed to the hilt, and I’m hitting the sack as soon as I’m done with this blog. I cannot believe that it took me from 7:00 o’clock this morning till 9:30 this evening to finally wrap things up! I am exhausted! I hope all our hard work pays off like in the above photo. 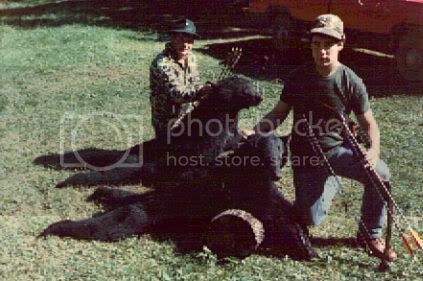 Actually we took three bear that year, but one of the guys had already left for home when we took this picture. We are going to set baits tomorrow when we get there, but will probably only have time to put two of them out. We’ll have to get the other four the next day. I hope the two “old geezers” doing the baiting can handle all the work. My wife said “You better come home ten pounds lighter” and I just may do that! We brought our tree stands, but I also threw a couple ground blinds in the trailer. There is one spot where I think a ground blind will work fine. I like the fact that ground blinds help cover your scent, and you can make alot of movement in them. We are also looking forward to a little brook trout fishing, and also some pike fishing in Lake LaVassure. We are bringing our newly purchased stainless steal fish cooking outfit, and hope to use it regularly. Can you believe I still had a package of venison backstraps left from last season?�� I’ve been saving them for a special occasion, and it seemed like tonight was that occasion!� When I got home yesterday I asked my wife what was for dinner, and she replied “I don’t know I haven’t had a chance to get any groceries!”� As I’m moving things around in the freezer I stumbled across a package marked 07-backstraps.� I got em out and said “here’s dinner for tomorrow.”� After they thawed I marinated them with Kraft Balsamic Vinaigrette dressing. 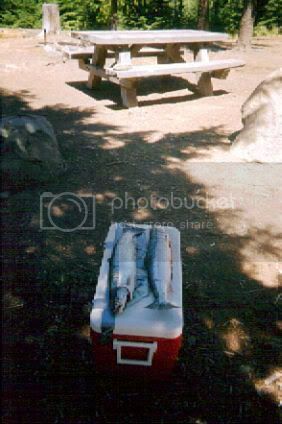 At first I put them on a pan on the grill, and poured some dressing over them.� I cooked them on medium for about 20 minutes, and then put them directly on the grill for another 15 minutes.� We had our friends Ed and Linda over, and along with my wife’s home made pizza, Ed and I devoured the venison.� I had basted it after taking it off the grill, and the tangy flavor of the dressing combined with the awesome taste of the backstraps, kept us from eating too much pizza! Well now my venison supply is completely gone.� It’s like Porky Pig used to say at the end of a Disney cartoon “That’s all folks!”� No problem the “08” season is just around the corner, and I plan on filling my freezer again! I want to give you an update on the “great horned owl blog” from the other day.� The lady that was hoping to rehabilitate him called and said he didn’t make it.� She was quite sad, as we all were.� The probable cause is either West Nile virus or some sort of poison.� It will take a few weeks to find out for sure.� Not a good way for this wise and noble creature to exit this life!� Sorry about the bad news. My brother-in-law Pat called me down to his house a couple evenings ago to get my advice on this “Great Horned Owl” sitting in his back yard. The chances of getting very close to one of these “night stalkers” is pretty slim. They do their hunting at night and only on rare occasions seen by humans. 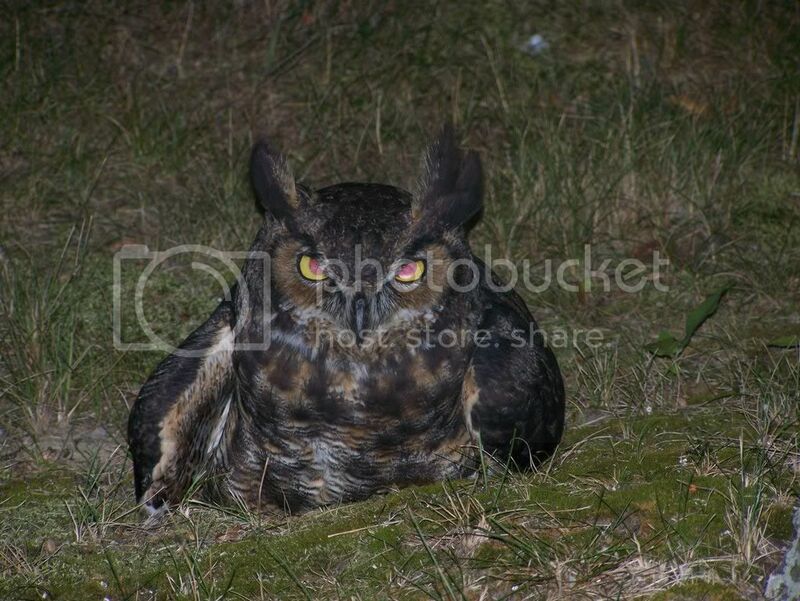 Pat knew something was wrong with this owl, as it didn’t move when he approached. I got within a few feet of it, trying to see if there were any visible wounds. None to be seen, but the birds huge night vision eyes followed my every move, even though he made no attempt to move. Definitely not normal! We theorized he might of been jabbed by a sharp limb from the scrub oak he was under, or had a broken wing, and we didn’t want to further the injury by trying to put a net over him. We figured the best thing would be to call animal control. After calling the police, the Dept. of Natural Resources, and animal control, we finally got the number of a private citizen who was a licensed rehabilitator. 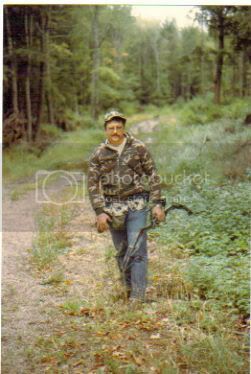 I just have to tell you about what happened to one of my old hunting buddies recently.� That’s Reverend Bob Baltrip, in the above picture, heading out to his bear bait while hunting with us in Marquette.� Bob and I go back a long way.� We met on the production line at Ford Motor Company and immediately “hit it off!”� Bob was in my wedding 38 years ago, and we camped, hunted, and just enjoyed one another’s company.� I got Bob started into bowhunting, and through his commitment to practice, practice, practice he become one of the best target shooters in the state.� Over the years we’ve not gotten together like we used to, but when we do see one another it’s like old times.� Bob’s major commitment is now to Liberty Missionary Baptist church where he is Pastor, and of course his faithful wife Linda, his children, and grandchildren. A couple weeks ago Bob was cutting the grass in front of his son Doug’s “Eye Care One” building when he keeled over, without warning!� He was on one of the busiest roads in Monroe and a nurse was driving by and saw he needed help.� She pulled into the lot, and immediately began mouth to mouth.� A passerby must have called 911 as a Monroe City policeman was there within a couple minutes.� This policeman just happened to have cardiac paddles, and gave Bob a “jolt!”� In the meantime another women stopped who had just taken a CPR class, and started to administer chest compression!� Between the three of them they got Bob’s heart beating again, as the ambulance whisked him to the hospital!� The doctors said that there is only a three minute window of opportunity when your heart gets out of sync. and quits beating.� Years ago this very same thing happened to a fellow pipefitter friend, and he didn’t make it.� There was no one around to help him.� The Monroe Evening News did a front page article about the ANGELS that saved the Pastors life.� I even heard his story was on one of the local T.V. stations. 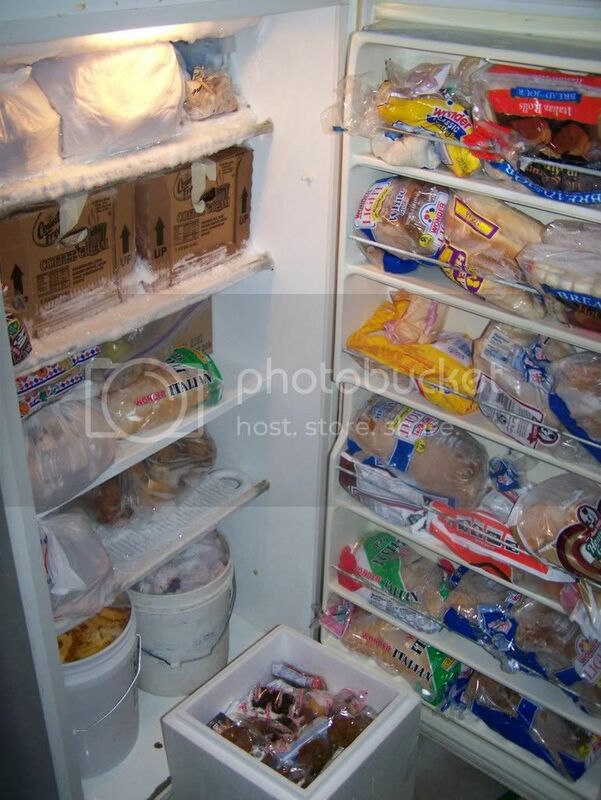 If your thinking “man is that freezer full” your right! 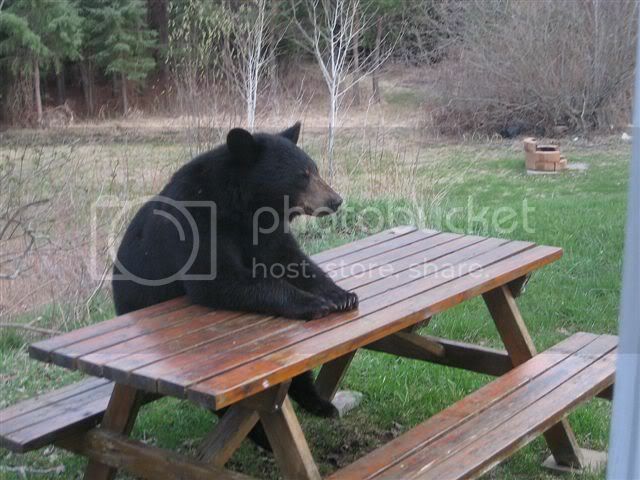 The only thing is though, everything you see is going to be used for bear bait. What you see here is all sweets and bread. This is only a very small portion of what is needed to keep 6 bear baits fresh for a two week period. Besides all this we have grease, meat scraps, fish, candy, and a concoction of my own consisting of oats, corn, sugar, syrup, honey, and melted marshmallows. No I’m not talking about the kind you eat, but the junk that keeps coming in the form of e-mails. Just in the last 5 days I have deleted over 10 million dollars in worldwide winnings. Am I crazy or what? I have spam guard on my computer which puts all likely span into a separate folder. I know from experience that there is a sucker born every minute, and there seems to be an e-mail con artist for every greedy sap out there! Listen to some of the spam I’ve recently received. From Dayzers The Netherlands; “phone and e-mail for your Dayzers prize!” Olajide Johnson says; “my good friend.” Trust me I have no good friends named “Olajide!” Then there’s one titled “UK National Lottery;” congratulations you have won! The only way I win this lotto is to hit the delete button! Next I have one from Nigeria that says; “fund transfer regarding your bank details!” Don’t those Nigerian crooks know that everyone in America watches “Nightline” and is on to their scams? Next I have one from the European Union Award that informs me “You have emerged as a winner 2ND!” Here in America you can’t be a winner unless you are 1ST. not 2ND! Those European con-men should know that by now. I don’t want no second place prize-even if it’s 5 million euro’s! Next one is from a Mr. Pascal Berry and he informs me that I need to “Contact the fedex courier service!” They probably want me to ship them my S.S. number, birth certificate, drivers license, and bank statements so I can claim my prize. (An empty bank account) Last, but not least is the Foundation Di Vittorio which says; “Attention Foundation Di Vittorio winner!” Please someone grab a wheelbarrow and help me haul all this “good fortune” to the garbage dump!!!!! Opp’s I missed one from a Ming Yang. Hers says “Good day (code no:AM-002.) Well Miss Yang must be part of the “Ying and Yang gang,” and this “homeboy” isn’t falling for that one! Man that’s about enough “good fortune” for one 5-day period don’t ya think? I can’t sign off without reading you one of the weirder e-mails I received during this past week. It was from “New Clothing Line.” The subject said; “Mike you can now dress like Jessica Simpson!” What the heck is that all about? They must of meant “Bart Simpson” or “O.J. Simpson” any Simpson beside “Jessica.” I’m beginning to dislike spam more each day, and “Frankly Miss Scarlett I don’t Give A Darn” if I ever get anymore! The above picture is of a couple steelhead I caught on the Columbia River in Oregon. I am going to smoke some fish for our up north trip on my electric smoker. I thought I’d pass the recipe on to you the readers of this blog, as it is one of the best I know of. First of all you need 4-pounds of steelhead/salmon fillets, 4-tablespoons olive oil, 8 cloves chopped garlic, 3-tablespoons crushed rosemary, 2-cups curing salt, 2-quarts water, and some ground pepper to your liking. You should soak your wood chips (hickory, alder, cedar, ect.) in water or wine for a couple hours. Now rinse the thawed fish fillets and place them in a glass baking dish. brush the olive oil on the fish and rub the garlic and rosemary seasoning into the fish. Cover and leave in the refrigerator overnight. Dissolve the curing salt in the water/wine and pour into the dish and let it marinate 30 minutes for 1 inch of thickness. 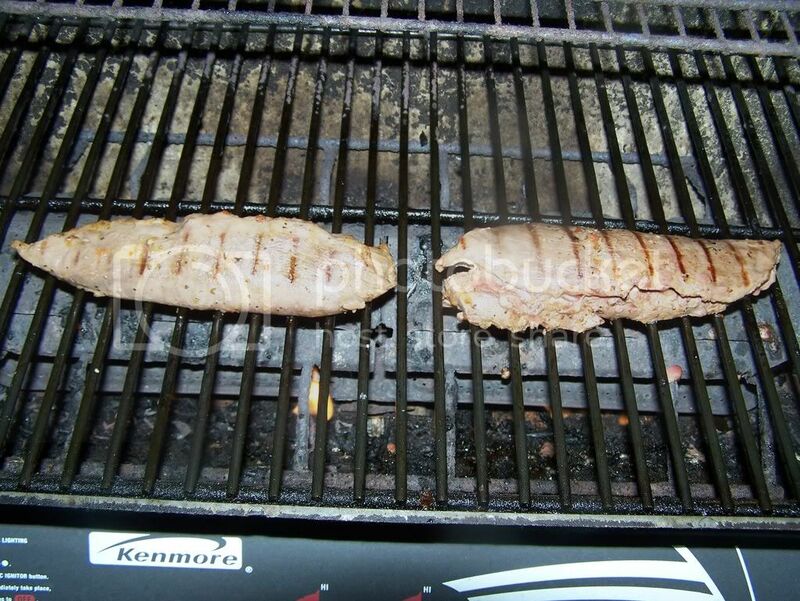 (15 minutes for 1/2 inch thickness) Pre- warm your smoker to 150 degrees. Place fish from brine on your rack with a fillet sized piece of aluminum foil under each fish. Season with pepper to suit your own taste. Continue to add wood chips as needed and let fish smoke for about 2 hours. For best results try and keep the smoker temperature around 200 degrees. If you have a thermometer the inside temperature of the fish should be 165 degrees. Remove from smoker and enjoy! A variation I have tried is to add honey to the brine mixture. This gives the fish a refreshing sweetness that your taste buds will love. I’ll bet not all my smoked fish make it to bear camp! The “Daisy” Day’s of Summer! 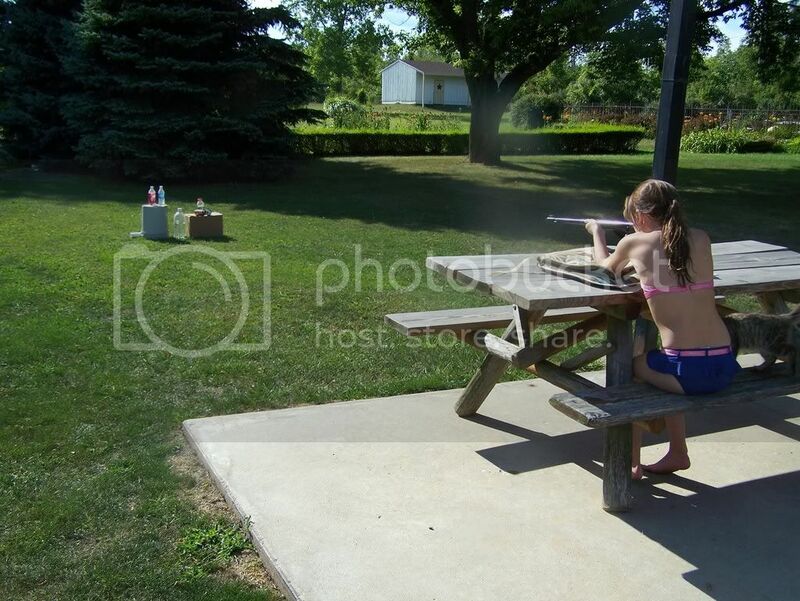 This is my grandson Keegan (Bubbie) McNamara shooting his new Daisy B.B. gun. Keegan’s grandmother, on his fathers side, bought it for him for his eight birthday. I seriously don’t think she knew what owning a “weapon” curtailed! Keegan didn’t have a clue about gun safety, and the potential power of one little B.B. shot in the wrong direction. They both are a chip off the old block, and Keegan actually beat me for the “championship!” He shot a 32, I shot a 31, and Nadia had a 28! We had fun, but even more importantly it was a good learning experience for us all. Although the gun is probably one of the least expensive models “Daisy” makes there is still enough power to damage things, animals, and people. There was enough “muzzle velocity” to shoot completely through the metal pop cans and some of the thinner plastic. We learned an important safety lesson concerning the harder plastic bottles. One of the B.B.’s ricochet off the bottle, and hit me in the foot, causing a nice red welt. No more targets that the B.B.’s will not penetrate. We’ll stick with paper, cardboard, and pop cans. As you can see by the photo’s Keegan is a “lefty” and Nadia shoots right handed. I also shoot left handed, but that’s the only thing I do left handed. That totally goes against the right eye left eye dominant theory. Go figure! 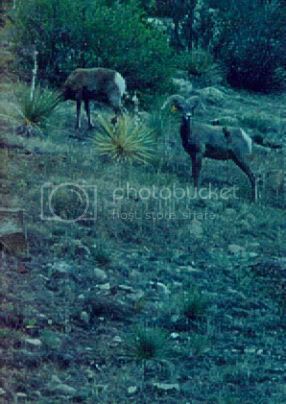 To me it’s always a “big deal” when you see your “first” of the wild creatures that inhabit this great land.� This picture was taken of the “first” Rockey Mountain Bighorn I’d ever seen, while hiking in the “Garden of the God’s,” in Colorado Springs.� The picture didn’t turn out as clear as I wanted it to, due to these rams grazing in the shadow of the mountains.� I had to do a little climbing myself, just to get within telephoto lens range, and I was huffing and puffing big time!� There were actually several other sheep, in this group, but they wouldn’t cooperate for a family photo. I have seen Bighorns since seeing my “first,” but always from a distance.� I would imagine that sheep and goat hunting would truly put you to the test concerning your stamina and hunting abilities.� They seems to inhabit some of the most dangerous terrain on earth.� I’ll leave that adventure to lean, mean, younger generation.